I am not sure what is happening to me, but recently I just have not been in the mindset to buy anything. I have some of my budget saved up and could make a nice investment purchase if I wanted. I debated on a DVF wrap dress or some Ferragamo flats during the Shopbop sale, but I couldn't commit. I also thought about a Tory Burch or Rebecca Minkoff bag, but I have some nice bags and I didn't want to buy something just to buy something. Perhaps it's just the changing seasons. I would rather not make any more winter clothing purchases, but don't want to buy spring clothing items until I can actually wear them. Whatever the case, I am glad. It will help me save a little extra so I can spend money on clothing during our trip next month! Still, I am curious, if you could have any investment piece in your wardrobe, what would it be? See how else I've worn this sweater worn here and here. absolutely love the outfit! love the sweater and the plaid! This is such a cute, casual look! I love your sweater with the gingham peeking out! I didn't get anything from the Shopbop sale either. I would have loved to get a DVF wrap dress too! It's a good thing you are not spending, I could really invest on a nice leather satchel bag now (maybe a designer one) and at some point I want a nice watch like a MK. 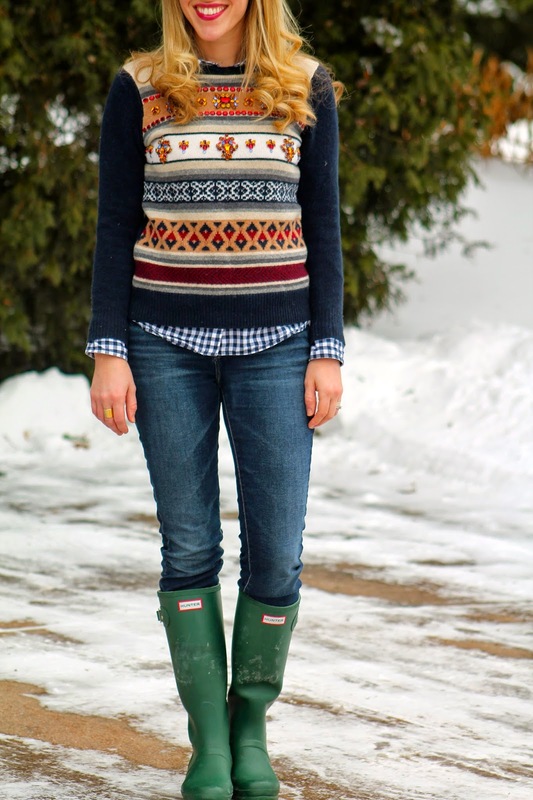 Your jeweled sweater is the prettiest fair isle sweater I have ever seen. And you know I love the Green Hunters. this sweater is so perfectly embellished, you look stunning! Cool look! Great work outfit! I'm with you on the not buying something just to buy something. I actually separate my clothes out by season (mostly because our master closet is TEENY) but that means a couple of times a year i get to "shop" my clothes that have been in storage and it's like getting a quick wardrobe refresh without any cost! 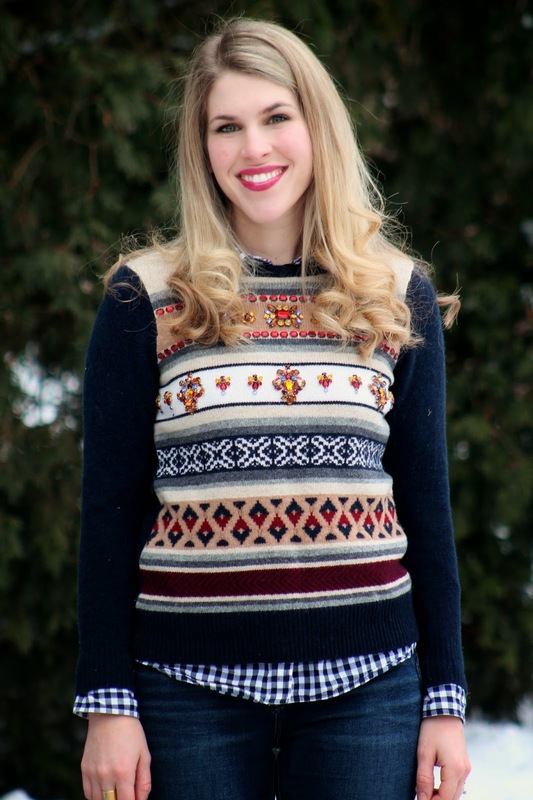 All that talk aside - your fair isle sweater is absolutely adorable! It's so pretty on you and has such a great colourwave in it! I love the bands that have been jewelled up too! Gorgeous! I wish I was a little more like you and actually saving some money! I've been building a little collection of spring clothes that I am dying to wear! Probably being in the last week of pregnancy, I'm just so excited to get out of these maternity clothes, haha. I love the Rebecca Minkoff bag, you should go for it! You look so cute! I love your casual outfit. I feel the same way about not wanting to buy for Spring until I cna actually wear the items. And I've been over winter for a while! I love this combo! That sweater is so fun! I adore those boots as well! I'm totally with you girlie. I just bought a warm, down coat this past weekend on sale but this was the first purchase I have made since before Christmas. I was up in the mountains and my thin North Face just wasn't cutting it so I went ahead, took advantage of the sales and invested in a warm jacket so I will be ready come next winter. I need a cute pair of rain boots like the ones you are wearing or nice winter coat but I will probably hold out a little longer. It's funny that you ask the question you do. I've been looking for a new handbag, and this weekend I found the most beautiful, most perfect one ever at TJ Maxx. It was just too expensive, and so I went home without it, regretted it, and went back this morning to find it was gone. So if I could have any investment piece, it would be that Kate Spade handbag. I am feeling the same recently. To me, rational saving is much better than irrational spending. 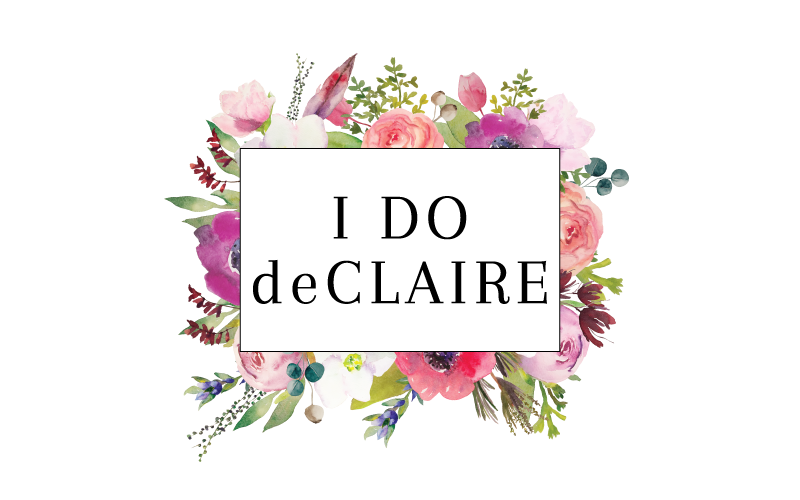 Investment in my closet? I am not sure I have a answer though. Sometimes I feel I have more than what I need to appreciate what I have. 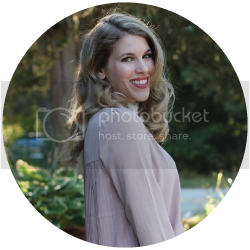 You looked like you stepped out of a J.Crew magazine- so pretty...love the outfit! And in terms of an investment piece, I always first think of bags. A good purse is something I wear on the daily versus a single article of clothing so I usually spend a bit more money on something that will last. I've felt that way for the past few months too! I don't know what it is, but I do agree the changing seasons does contribute to it. I love your outfit! The gingham and fair isle work so well together! I haven't wanted to purchase anything yet either, altho I just bought a new Garmin for running this month and I don't want to spend anymore. I would like to hit the outlets later next month for some new Spring clothes and accessories, tho. 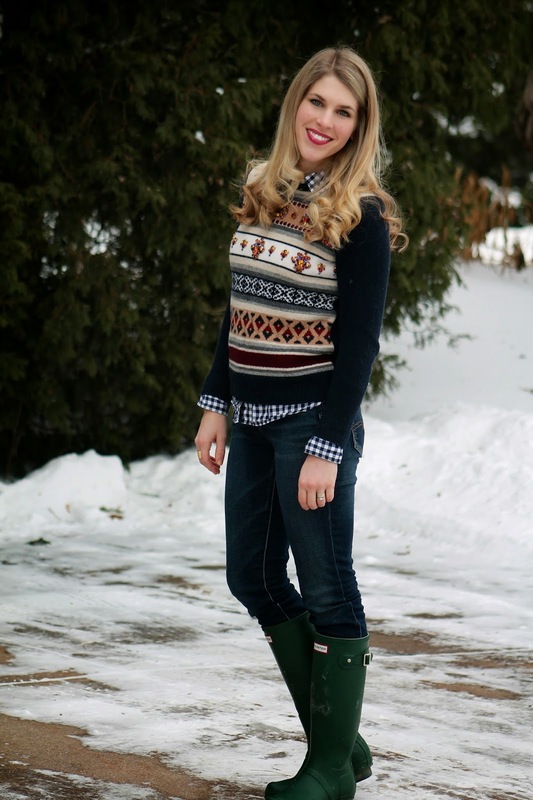 Your green hunters look great with this fair isle sweater! I love the gingham underneath this sweater! The 2 prints go really well together. such a darling sweater! I love the green boots! super cute! There are definitely times when I've shopped for the sake of shopping, but it's better to just reserve your budget for what you really want. When it comes to investments, I'm all about the bags. You are being so smart not buying anything just because you can! I try so hard to not want new clothes, especially a few staple items I need to replace. Keep that feeling as long as possible! 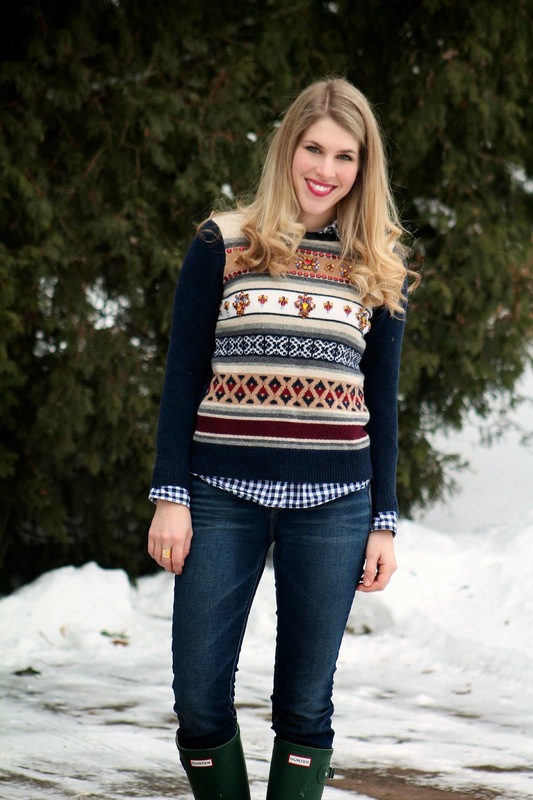 A gingham shirt was the perfect pair for your adorable fair isle sweater. The combo looks great together! I admire you for not just buying because you can...I think that makes subsequent purchases that much sweeter! And, extra money for Ireland....bonus! I just wore my Avoca scarf over the weekend and it is so special to me! The gingham shirt looks fabulous with this sweater! Great pattern mixing. That is one store I am so excited to go in! Claire is going to be getting a few Avoca souvenirs!